Call me old fashioned, but I still like a desktop to do my work. I’ve notice that laptops are taking over. But I’m interested in raw power. You can’t get that from a laptop without a giant fan installed to cool the tight spaces. Which is why I will focus on the nettop. There’s no point in owning a nettop. 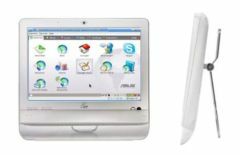 A nettop is basically a desktop version of a netbook. It’s small, quiet, and powered by an Intel Atom cpu. It costs about the same a netbook. So if you are going to buy a nettop, get a netbook. At least you’ll be portable. The only advantage you might have with a nettop over a netbook is that you might get a touchscreen…a really small one. If you’re looking for a desktop, get a real desktop. This entry was posted in Desktop, Fixes, hard drive, marketing and tagged nettop on March 23, 2009 by Chief Monkey. External hard drives are an easy way to increase media storage. If you work with large images, music files, and video, an external hard drive is almost essential for you. I deal with all three of the above so storage is important to me. There’s one hard drive that I like the most because it’s small, portable, spacious, and easy to use. The Western Digital My Passport drive has not disappoint me. The drive is 320GB and is about the size of a BlackBerry Curve. I can’t believe this little drive is 320GB. 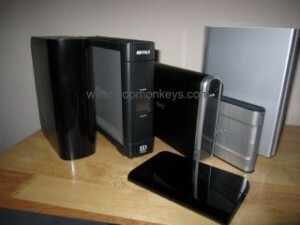 In the first photos, most of the external drives are 500GB. The best part of the Western Digital My Passport drive is that it only need a USB 2.0 cable to power and connect the drive. There’s no other power supply needed. Best of all, I carry this with my Asus Eee PC 1000H (only $389 at Amazon.com) to have access to all my media files. They are both tiny and can easily fit into a slim dvd player case. The Western Digital is available in assorted colors and in different capacities. Prices are extremely good at Amazon.com. This entry was posted in hard drive and tagged External Hard Drive, Review on January 6, 2009 by admin. For the past 2 weeks, I’ve been debating whether or not I want to install a Solid State Disk in my Asus Eee PC 1000H. To maximize speed and battery of my Eee PC, an SSD would certainly help. But the price, $179 after rebates at newegg.com, is definitely holding me back from doing the mod. SSDs suffers from memory cell loss. Like a battery, the capacity of a drive slowly depletes. For me, it’s not quite worth it to spend that much on an SSD. Intel is supposedly developing their own line of affordable SSDs. I think I’ll leave the Seagate drive in the Eee PC alone for now. This entry was posted in hard drive, Uncategorized and tagged Asus Eee PC, Mod on October 27, 2008 by admin. How to choose the best external hard drive for you. Click on the picture to go to the product page on Buy.com. If you just need more storage, a simple drive is for you. 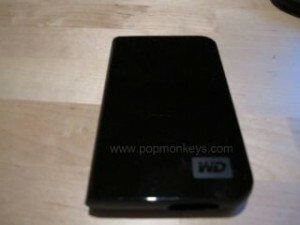 I recommend the Western Digital 500GB My Book drive. I have one of these personally. If you are an intermediate user that works with large images and need to connect via FireWire, USB, or eSATA, than this drive is for you. If you have media or files you want to share with other computers in the house, than the Buffalo LinkStation is for you. This drive features 2 USB ports and a network port. The drive connects to your network like any computer, most likely through a free port on your router. Any file on the drive can be shared to any computer on the network. It’s that simple. This entry was posted in hard drive, Recommendation, Review and tagged Add new tag, hard drive, Reviews on June 16, 2008 by admin. I’m really paranoid about my external drives ever since my Seagate FreeAgent drive died – only 2 months old. I have a WD MyBook 500 GB drive. I nicknamed it Darth Vader because it’s all black and shiny. It’s my back drive for music, pictures, and video. My primary drive is the Buffalo 500GB DriveStation. It’s actually a very nice drive. The Seagate started up every time my computer booted up. I have to turn it off every single time. But the Buffalo drive has a switch. Very nice since I don’t access the drive that much. 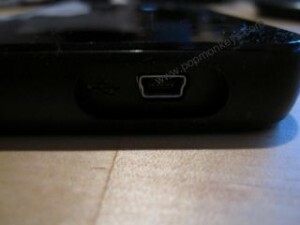 Also, it has a firewire port. Very nice since I also have a Mac Mini. My only complaint is that it can be a little loud, especially since it is right next to my monitor. This entry was posted in hard drive, Review on April 27, 2008 by admin.